Title loans are like the proverbial comfortable bed: They’re easy to get into, but you eventually need to get out. They’re typically expensive, and they tend to stick around a lot longer than you initially expected. As a result, you continue to pay and roll the loan over month after month. Title loans are also risky—you can potentially lose your car, making it hard to get to work and travel safely (unless you have reliable public transportation). So, how can you get rid of a title loan? Here are six options, plus a few tips to protect your finances. The most straightforward approach is to pay off your loan, but that’s easier said than done. If you had the money, you wouldn’t have borrowed in the first place. But if you now have the cash to repay, contact your lender and ask for payoff instructions. Don’t be surprised if it’s difficult. Most lenders will gladly accept your payment, but some title lenders drag their feet and prefer that you continue paying interest. If you don’t have extra money available, it may make sense to sell the car to generate cash. Selling is difficult when you don’t have a clean title (when you still owe money), but it’s possible, and it happens all the time. Downgrading to a less-expensive—but safe—vehicle can save you hundreds or thousands in interest and fees. You can also free up cash flow every month with smaller payments. Another way to get rid of your title loan is to replace it with a different loan. This doesn’t solve the main problem (that you’re short on cash), but it can stop the bleeding. A fixed-rate loan from a bank, credit union, or online lender is often less expensive than rolling your title loan over month after month. Even a convenience check from a credit card can reduce your costs—as long as you are certain you’ll pay it off before any promotions end. Paying off the title loan also allows you to get your title back. If you’re having trouble getting approved for a better loan, visit local banks and credit unions, where you have a better chance of qualifying. Online peer-to-peer lenders are also worth a look. If all else fails, somebody close to you might be willing to co-sign and help you get approved. Just make sure they are willing and able to take that risk. Your existing lender might be willing to work with you, so it’s worth trying to negotiate. Offer what you can afford to pay and see if the lender accepts. Especially if your finances are spinning out of control, your lender might prefer to get something from you before you become completely insolvent. Even when things aren’t dire, you might find that your lender has options available. For example, there may be a way to lower your interest rate or make other adjustments that lower your payments. If your lender agrees to take less than you owe, your credit will suffer because you pay less than the previously agreed upon amount. You’ll have lower credit scores for several years, and borrowing will be more difficult and expensive for you during that time. Still, a settlement can help you get back on stable ground. Another option is to simply stop paying, but that’s probably not your best option. Defaulting on a loan will damage your credit, and your lender will eventually repossess the car. As a result, you’re left with bad credit and no car, and you’ll probably still owe money. Offering to voluntarily surrender your vehicle can improve the situation, but you’ll still see lower credit scores. On the bright side, you’ll be done with monthly payments—and that might be enough to get your finances in better shape. The Devil is always in the details, so speak with a local attorney and discuss your situation. A professional licensed in your area might identify important details that this article does not address. 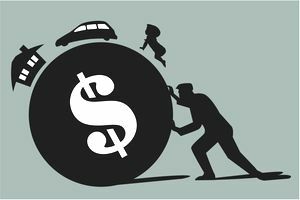 In many cases, bankruptcy offers limited relief from auto title loans. It can help you avoid personal liability for deficiency judgments, but the car often continues to serve as collateral for the loan and can be taken if you fail to repay. Your best bet is to avoid title loans in the first place. Once you put this behind you, get prepared for the next financial challenge. Build up an emergency savings fund of three to six months’ worth of expenses (or preferably more), and improve your credit so that you have more options when you need to borrow. The Military Lending Act provides additional protection for service members and certain dependents. Read more about that protection, or visit Military OneSource to speak with a financial expert.